It seems entirely appropriate that I've started writing this on a Hawaiian Airlines jet en route to Maui's Ritz Carlton Hotel to screen my film SURFING FOR LIFE (SFL) at the hotel's "Celebration of the Arts." I've just completed a rigorous month of promoting and publicizing the film's theatrical openings throughout the Bay Area. 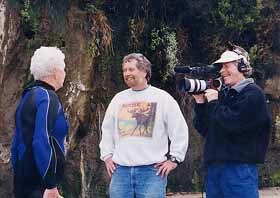 Our web site home page, SurfingforLife.com (funded by PIC), will be up any day and I just received word that American Public Television (APT) has accepted SFL for a national PBS broadcast. I feel the stress receding as beautiful images of Hawaiian beaches come into focus. Aloha sweet islands! At the sold-out premiere of SURFING FOR LIFE at the Hawai'i International Film Festival, from left: co-producer, Roy Earnest, Woody Brown, Peter Cole, Eve Fletcher, Rabbit Kekai, Anona Napoleon, John Kelly, Shay Bintliff, Fred Van Dyke, producer/ director, David L. Brown. SURFING FOR LIFE is a 68- and 56-minute documentary that profiles ten older surfers - seven of whom live in Hawai'i - as inspirational models of healthy and successful aging. Six years in the making, it was the hit of the 1999 Hawai'i International Film Festival where it sold out nine screenings on four islands and won the Golden Maile Award for Best Documentary as well as the Audience Award. The aloha-rich Honolulu premiere was especially heart-warming because eight of our subjects were there to be honored along with their keiki who were in the film. The joyous, laughter-filled Q & A session -- with Woody Brown (88), Rabbit Kekai (79), Anona Napoleon (60), John Kelly (81), Fred Van Dyke (70), Peter Cole (69), Eve Fletcher (74) and Shay Bintliff M.D. (64) - lasted nearly an hour. The origins of this documentary go back to my earliest years. My parents met in Hawai'i, and the islands' charms and Hawaiian culture assumed near legendary dimensions in our family. Then, in my high school days in Denver, the Beach Boy's Surfing USA first topped the charts. The best band in the entire state was The Astronauts, a surf band from Boulder, and the entire surfing scene--music, clothes, lingo and attitude--was the hippest around. Years later, when I first moved to Hawai'i, I spent a full day witnessing a small army of photographers and filmmakers shooting surfers riding 25 foot waves at Waimea Bay. It was that unforgettable day in 1971 when I first thought seriously about becoming a filmmaker. Flash forward to 1993 when my wife, Jane Kinzler was talking with surfer/ gerontologist Roy Earnest, her colleague in the San Francisco senior services community. 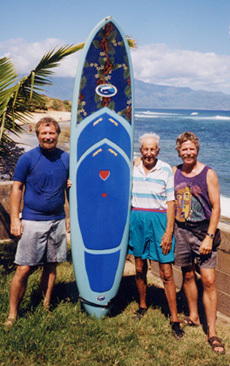 To foster a more positive image of later life, Roy was developing a workshop on healthy aging and had written an article on older surfers as an example of the "age wave." 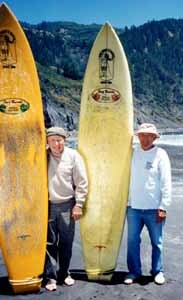 Jane suggested the combination of old surfers and healthy aging was a great concept for a documentary, and that Roy should come to the premiere of BOUND BY THE WIND, my PIC-funded film on nuclear "downwinders." I was coming off of fifteen years of filmmaking focused on very somber topics like nuclear power, nuclear war, toxic waste and radiation victims. I was more than ready for a project that was a bit lighter, more life-affirming and more fun. Older surfers sounded absolutely right. 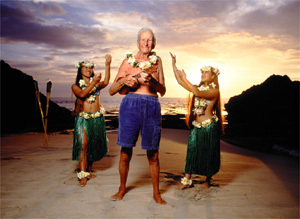 Woody Brown with Hula Girls, shot for the New York Times Magazine by Karen Kuehn/Matrix. So, Roy and I agreed to co-produce and SURFING FOR LIFE was born in high hopes and great enthusiasm. I felt confident about the fundraising potential because of our healthy aging approach. I began casting, researching and developing the proposal. 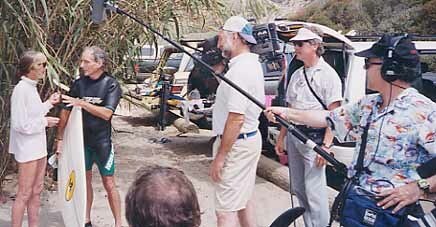 The casting began with a meeting of Roy's oldest surfing friends who offered several excellent suggestions including John "Doc" Ball (93), Fred Van Dyke (70) and Rabbit Kekai (79). Within a few months, I had spoken with nearly 100 surfers over sixty, developed a database of over 250 contacts and grown to appreciate the fascinating history of this unique sport and lifestyle. Our criteria for selection included: being lively, healthy and engaged; still surfing; a good storyteller and role model; and, ideally, with archival surfing images. Not surprisingly, we found a wealth of great candidates in Hawai'i. While casting and networking, I did a comprehensive datebase search for media funders interested in aging and health, arriving at 60 solid prospects. We applied to 40 before beginning to target companies in the surfing industry at the Action Sports Expo in San Diego. BOUND BY THE WIND enjoyed several foreign television sales which, combined with part of Roy's savings, enabled us to begin production with interviews and verite shooting with Doc Ball, Fred Van Dyke and Eve Fletcher. We cut a sample tape after making the final funding round at the Independent Television Service. But, after 40 straight rejections from foundations and even more dismissals from the surfing industry, we came to a painful conclusion: we had seriously underestimated both the prejudice against surfers in the foundation world and the deep-seated fear and loathing of the elderly in the surfing industry. We faced a crippling double stereotype, we were out of funds, the credit card bills were rising dangerously and we realized that this film could be a very long haul, after all. Our fundraising approach shifted to organizing fundraising screenings for Roy's two main constituencies: the surfing community and members of the field of aging. Over a dozen house party and senior center screenings enabled us to raise enough to afford our first Hawai'i shoot, with John Kelly, Anona Napoleon, Woody Brown and Rabbit Kekai. We also continued to improve and expand our sample tape that screened widely at several aging conferences and generated remarkable press for a rough work-in-progress. I knew the press coverage would be helpful but I couldn't have anticipated how helpful. David Collier Shooting Doc Ball with Director, David L. Brown, Sound Recordist, Elizabeth Thompson. Our focus, themes and interview strategy evolved over the first two years. We knew early on that we wanted each surfer to address the key aspects of healthy aging: exercise; diet; community; friendship; family; love (and aloha); spirituality; social activism; closeness to nature; the challenges of aging; and, most important, passionate involvement. Clearly, surfing would be the central metaphor for that passion and for the potential of later life for all of us. But we soon decided that we wanted our stories to go beyond aging, to touch on other aspects of rich, meaningful, well-spent lives, including conflict, regret and struggle with the hard times. It was important that the film be much more than a feel-good fluff piece on old jocks. The challenges and delays in funding enabled us to deepen our story-telling, adding complexity, nuance and drama to our portraits. Beyond honoring the elderly or kupuna, the film's core values came to coincide more and more with the values of aloha and 'ohana, the many levels of love, kindness, generosity, compassion, service and family. The values of aloha 'aina and aloha kai ("love the land, love the sea"), and living in lokahi (balance) with nature were the underlying environmental values of Hawaiian culture and the strongest links to my earlier environmental and antinuclear documentaries. I was very pleased to discover that John Kelly was one of the country's first anti-nuclear activists in the late forties and founded the country's first surfers' environmental organization, "Save Our Surf" (SOS), the precursor to Surfrider Foundation. SOS organized the largest demonstration in Hawai'i's history and, through very effective grassroots organizing, stopped over 30 coastal developments that threatened Hawai'i's beautiful shoreline. The values of aloha and 'ohana in SURFING FOR LIFE are embodied in each of our subjects, but perhaps most clearly in native Hawaiians Anona Napoleon (60) and Rabbit Kekai (79) and in Shay Bintliff, M.D. (64), a resident of the Big Island. Anona's sequence on "Napoleon's Holiday" captures the spirit of 'ohana when she and Nappy, her legendary canoe helmsman husband, take the children and grandchildren out of school and work to surf, paddle and enjoy a therapeutic family day in the ocean. Rabbit talks about passing down what he learned from Duke Kahanamoku to the younger generations as we see him giving a surf lesson to a very happy young woman we cast for the lesson. Shay, who has known Rabbit for 35 years, says "Rabbit is a legend. He IS aloha, he just oozes aloha, for the 'aina, and for the sea." Shay then defines her extended family to include everyone from her ex-daughter-in-law to her pet ducks. Her sequence with the granddaughter she adores and her peak experience surfing while holding hands with her two sons, is another memorable tribute to the importance of 'ohana. Another embodiment of aloha in SFL is the amazing kahuna kupuna, 88 year-old Woody Brown, world record glider pilot, inventor of the modern catamaran and one of the first surfers in the world to ride Hawaii's 25 foot waves. SFL captures Woody selfless, loving spirit as he volunteers at Hale Makua Adult Day Health Center, assisting frail seniors much younger than he is. 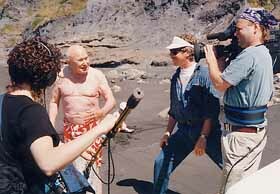 It was a visit to Maui by Roy, when he surfed and hung out with Woody Brown in June '97, that inspired and convinced him that we HAD to make our final Hawai'i shoot happen - with or without funding. Roy returned home totally inspired by Woody to figure our how we could produce a $6,000 ten-day shoot for virtually the cost of food alone. By August, we had wrangled free airfare from friends donating mileage, free lodging from Fred Van Dyke at his North Shore beach house (100 yards from Pipeline! ), and a donated DV camera from Rob "Birdlegs" Caughlan who also volunteered to crew. The long-anticipated final Hawai'i shoot was green-lighted and we would stay at the world's most famous surf beach! The ten-day shoot had so many memorable moments. Some highlights included: the shoot at Punahou School with Fred and Peter Cole hilariously reminiscing about skipping the dreaded mandatory faculty meetings when the surf was up; the two-day Woody Brown shoot on Maui where he was recognized and showered with adulation before and after surfing at Ho'okipa: and the group shoot at Waikiki when Peter, Fred, Anona, John, Shay and Rabbit were totally "stoked" to be surfing together and were afforded enormous respect and courtesy in the lineup. Of course, if Rabbit Kekai tells the surfers anywhere in Waikiki that the next wave is for the "kupuna surfers," they obey and defer. After the surf session, the lively conversation about their mutual friends was a joy to observe and record. We returned home from our final Hawai'i shoot exhilarated, with 28 hours of mini DV footage and renewed hope for completion funding. But, it was another year of small grants (some from Hawai'i, like Cooke Foundation), fundraising screenings and "character-building" before the skies opened to reveal the luminous funding angel. Following a screening at the Pacific Film Archive arranged by the UC Berkeley School of Social Work, a reporter who saw the film wrote a glowing review in the Contra Costa Times. The President of Seniority, Inc., a developer of senior housing, saw it, called me and asked to see our sample tape to consider partnering with us to complete the film. He liked what he saw and generously contributed half the entire budget in exchange for rights to use the film and some of our surfers to promote their senior housing developments. The lesson: never underestimate the value of publicity. You never know who'll read it. Post-production began in earnest with Avid logging even before I completed an intense year of producing, writing and directing CROSSING THE DIVIDE, the concluding episode in the timely four-part PBS series DIGITAL DIVIDE. The series focused on teens, technology and the disturbing gap between the digital haves and have-nots. Throughout the second and third years on SFL, I had also traveled to Java and Cuba on film projects. Through a producer friend in L.A., I reached actor and surfer Beau Bridges, asked him to narrate SFL and, after screening the sample tape, he gladly accepted. I hired Shirley Thompson, a whiz on the Avid and a superb narrative and visual editor, and she made the documentary flow and sing. We followed the basic structure I designed for the paper edit, interweaving ten stories along thematic lines with Fred Van Dyke's dramatic decision to quit surfing big waves as the emotional climax. The last act was the biggest challenge. The main issue was how much of Fred's intensely honest and emotional story to include. His traumatic decision to quit surfing 20-foot waves around age 58 became the central metaphor for the challenges of aging as well as the dramatic peak of the film. Fred's recovery from that painful decision, one that left him feeling "no longer part of the gang" of big wave surfers, is the hopeful turn toward the film's upbeat ending. Through an attitude shift, better diet, exercise and the loving support of his wife, Joan Marie, Fred comes to accept his own aging. He then states the overriding theme of the film: "If I'm getting old, I've gotta dig it." Classic wisdom from Shay Bintliff ("Change is inevitable. It's the growth that's optional. "), Woody and Doc brings it home on an inspirational note, then Doc's ripping skateboarding leaves them cheering. Legendary Hawaiian musician, Eddie Kamae, attended our Ritz Carlton screening, giving me an opportunity to introduce and thank him for his contribution to our sound track with The Sons of Hawai'i. I'm especially proud of the SURFING FOR LIFE sound track featuring 17 tracks of Hawaiian slack key and steel guitar music, including Gabby Pahinui, the Tau Moe Family, Ray Kane, Dennis Kamakahi and George Kuo. The four Hawaiian music labels we worked with -- Hula, Panini, Dancing Cat and Rounder Records -- were very accommodating in accepting our "most favored nations" deal for discount licensing fees for synch and master rights. Not quite such a bargain were the Beach Boys' Surfin' Safari and Johnny Mercer's Ac-cent-tchu-ate the Postive, but we felt we had to have both songs. 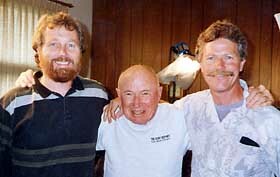 I negotiated good rates with most of the surf filmmakers, like Bud Browne, Greg Noll and Bruce Brown, for surfing archival footage. Some cameramen, like the great water shooter Don King, donated their footage. Tom Disher composed a brilliant and multi-dimensional score with great surf music and toe-tapping big band swing. Cameraman Stephen Lighthill shooting Eve Fletcher and Mickey Munoz, with director David L. Brown. The final 68-minute cut was on-lined on an Avid Symphony at Milt Wallace Video and transferred to 16mm film for Academy Awards consideration before we edited the 55 minute version for foreign TV sales and PBS. The popular and critical response has been very enthusiastic with mostly four star reviews and mercifully few mentions of "surfing geezers." The adjective used most often has been "inspirational." We've received hundreds of emails and letters with tape orders praising the documentary and sharing uplifting stories about 80 year old surfer parents or friends, or how a social worker screened the film for depressed seniors and sparked a long and lively discussion. American Public Television seems very pleased to send the program out to PBS, and KQED in San Francisco has happily agreed to become the PBS presenting station. Roy and I are grateful for the response to our film and the affirmation of our vision. 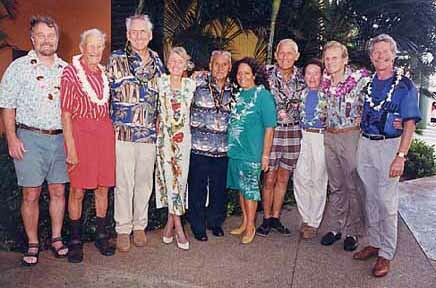 We're both so much richer for having met and become friends with these ten extraordinary senior surfers-people filled with humor, vitality, compassion, joy and aloha. And we're privileged to share some of their stories with an international audience. May those stories bring hope and inspiration to millions about the potential of later life. I know they've inspired Roy and me. 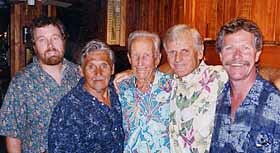 Mahalo and aloha to our extraordinary older surfers, and to everyone who made our film possible. Mahalo and aloha Hawai'i.